They met each other in the early 1990's while playing their music at the Folk Factory Coffeehouse in The Mt. Airy section of Philadelphia. They both went on to become repeat winners of the Folk Factory’s People’s Choice Award – and each other’s personal choice as marriage partners and musical partners in the duo Winchester/Perry. Their very first paid gig was for a Dr. Martin Luther King Jr. Day celebration in Philadelphia. 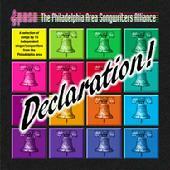 Over the years, they have performed live at a wide variety of venues and had their songs played on radio and featured on several recordings, including Declaration!, a compilation album released by PASA, the Philadelphia Area Songwriters' Alliance. Click on the sound files (above) and YouTube videos (at right) to hear Winchester/Perry's music in action. Enjoy! Christine plays guitar and keyboards and sings her songs with beauty, power and expression reﬂective of the trained actress that she is. As a solo artist, she enjoys performing her own material and popular cover tunes. For many years, she has helped run PASA, the Philadelphia Area Songwriters' Alliance. Her day job is working as a Realtor for Re/Max Services in Blue Bell. David is a full-time children's entertainer, whose “Mr. David Drawings, Songs & Silliness” shows are a playful, interactive mix of music, pictures, puppets and props that appeal to the kid in us all. A multi-talented artist/musician/comedian, he has popped up everywhere from the Please Touch Museum to WXPN's Kids Corner to the Philadelphia Folk Festival. He also draws caricatures and conducts cartooning workshops. Christine and David live in Norristown, PA, with their 14 year old daughter, Allison, who occasionally can be persuaded to join them on stage. Left: The cover of "Soulmate" - a cassette single that was their first recording. Take This Snow and Shovel It! Click the YouTube logo above to play the video larger and watch Christine and David voice the frosty frustration felt by many of us last cold and snowy winter. Click here to listen to a studio recording that you can download.